I am so sorry that I was not able to post the round up for the event. Thanks to all for sending me those wonderful recipes and also for being patient. Everyday of the last month I got so many mails for the event. All the mails had so many different kinds of recipe. To tell you the truth the first time when the idea of this event struck I was not at all aware that I’ll get so many different types of recipes with rice or rice flour as the main ingredient. This is really unbelievable. Go ahead and comment on your most loved recipes. I would love to know about your comments. Check out the other parts of the round up, till then Happy Cooking and happy Eating . This entry was posted on February 16, 2009 at 8:44 pm	and is filed under Chicken, Dinner, event, More to rice, Niramis(Vegetarian), Side dish, snacks, Uncategorized. 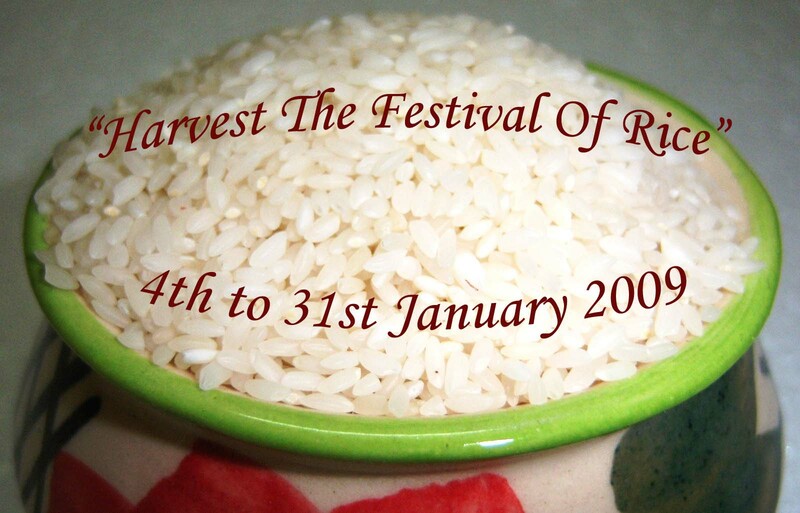 Tagged: bhaat, bhat, biriyani, chicken pulao, chinese rice, dosa, event, fried rice, harvest, khichdi, pakistani cuisine, pongal, pongal lemon rice, pulao, ricem rice flour, south indian cuisine, steamed rice ball, sundal, sweet, veg pulao, zuchini. You can follow any responses to this entry through the RSS 2.0 feed. You can leave a response, or trackback from your own site. Thanks for visiting, will surely put in the next round up. Nice roundup…waiting for more to come!!! I’ll be putting up the rest in the next roundup. You can find yours there. Sorry for not fitting it in this one. Hey sudeshna thats a whole lot of great recipes. ! I failed to send one:-( but atleast i am here to enjoy all the lovely dishes. Great job! Hi Sudeshna, Howz ur hand?….Hope u r feeling better…Nice collection of recipes…Looking forward to the next part. Thats a great round up Sudeshna. You’ve done a good job.